From the blockbuster Justice League, movie comes Steppenwolf as a 8-ction Action Figure! 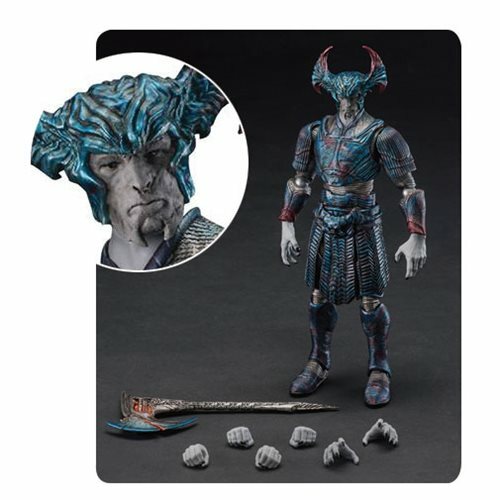 The Justice League Movie Steppenwolf DAH-010 8-ction Action Figure - Previews Exclusive was created using official references and scanned 3D images of the actor Ciaran Hinds. Special paint coating is applied to present the various metal radiance in the armor. The action figure stands approximately 8 2/3-inches tall with 20 points of articulation. Accessoreies include the electro-axe and hands of various shapes for many different poses for Steppenwolf.